I wanted to create a soothing soap to soften and brighten skin. I immediately thought of including two breakfast staples: honey and oatmeal. Together with a goat’s milk melt and pour soap base, they create a beautiful soap that does both. Honey is moisturizing and makes skin “glow”. It’s been used in many skin care recipes because of the multitude of benefits it offers. I liked that it was already in my pantry and I didn’t have to hunt it down online like I do with some ingredients. My daughter eats honey on her toast for breakfast so it’s something we always have on hand. Oatmeal is great for sensitive skin and has anti-inflammatory properties. I remember my sister suffering from eczema and my mom giving her an oatmeal bath. Cut melt and pour soap base into cubes and add to a microwaveable bowl. Microwave on high for 30 seconds. Then microwave at 10 second increments, stirring in between, until melted. Mix in oats. Pour into a silicone soap mold. Drizzle honey into each soap mold and swirl it around with the end of a spoon. Let sit for 40 minutes to an hour. Remove from soap mold by turning the mold upside down and gently pushing on the back of each soap. You’ll love how easy my soap recipes are to make. I adore using the melt and pour soap bases. They are relatively inexpensive and so simple to prepare. It’s fun to be creative with soap making. You should give it a try! I know you can do it too. My beauty section has a bunch more DIY beauty recipes including scrubs ands soaps. And yes, I’ll be doing more so keep on eye on the blog for the next recipe. Do you like the honey/oats combination? That looks like a great soap recipe. Does the honey melt into the soap or stay on the top? 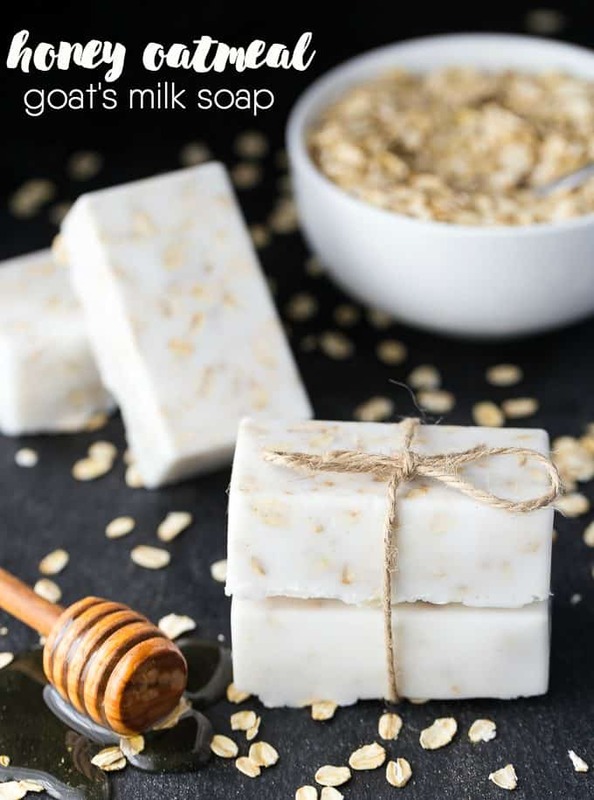 I have always wanted to try making soap and this looks to be an easy recipe for it. This soap looks so clean and nice. Such an easy recipe, thanks for sharing. Thank You for the recipe. I have been making my own face cream,Body cream,deodorant and scrubs. This soap will be the next one. Soap making has been on my want-to-do list for awhile now. This soap look gorgeous and your very simple to follow. I’m going to have to give it a try! Thanks for sharing! I never knew that fact about oatmeal and eczema. I can’t wait to try this it sounds like it would be wonderful to my skin. Your soaps are lovely! It looks like soap making is doable. I’ve always been curious about the process. Thank you for sharing! This must feel great on the skin! Makes a nice homemade gift! Do you have a cure time for this soap? Also how long will it last if made ahead of time? I use melt and pour base so it takes about an hour to harden up. It keeps for a month or two. How many bars of soap will this recipe mak? It makes about 4 bars. What kind of oats do you use for this? Could I use oats that you would make oatmeal with? Haha. I used the large flake oats! Any kind should be ok though. Use whatever you have. Going to try making this with my 12-year-old this weekend but, just curious … why not mix the honey in before pouring into the soap molds? You could do it that way too! Can this be poured in an ordinary plastic mold? or does it have to be a silicon mold? You can use plastic. I just find it a lot easier to remove from the silicone molds. I made these wonderful soaps for my daughter’s baby shower. They turned out Great! Just some F.Y.I. 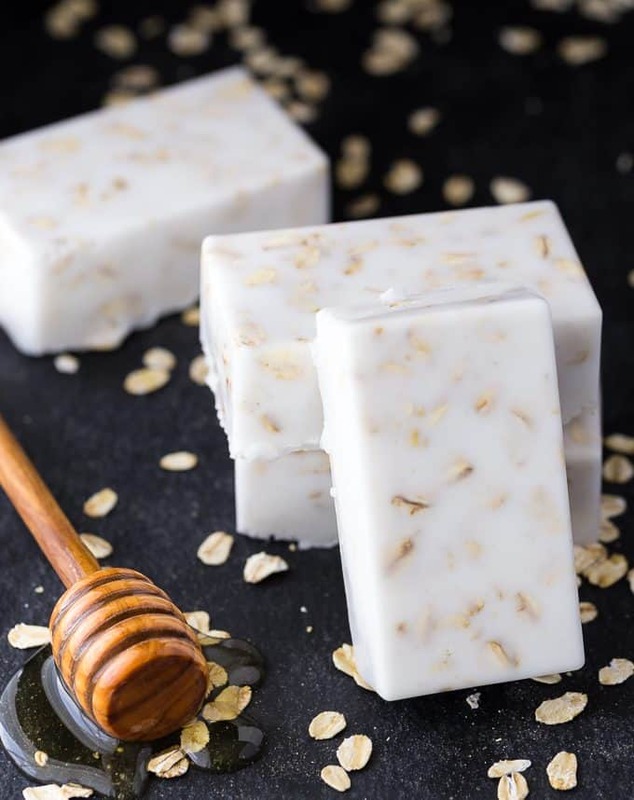 : I used the one minute oats and they sank to the bottom…making the soap have a look of 1/2 & 1/2…which was also ok, since the colors of the shower are white with some natural. I have a question: Does the soap need a cure time, since it seems like it would melt quickly? I use melt and pour soap bases so they don’t require a cure time. Ps…I mixed the honey in with the oats…just mix it in well, if not, it leaves stickiness on the top.